Tourists are heading to Savannah for St. Patrick's Day and Jack is racing through tunnels below the city to the edge of Hell itself to hold off a plot posed by the double-dead and demented. But Jack must also hold off his own desire for Connie Jones, the beautiful cop he turned into a vampire slayer who's got him at the top of her hit list! 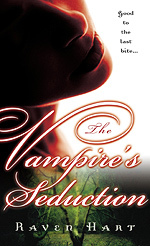 "Fans of the early Anita Blake books are sure to love the Savannah Vampires series." Jack faces his greatest challenge yet when he must rescue Connie from the underworld only to learn that she threatens the existence of him and his kind. What will he do when ordered to kill her? Meanwhile, the bloodthirsty Old Lords harness elemental powers to raise the evil dead! THE VAMPIRE'S BETRAYAL. 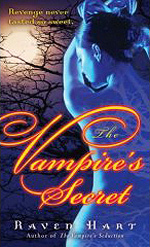 "The Vampire's Kiss is a non-stop, action-packed thrill ride." William goes abroad to rescue a voodoo princess, leaving Jack to protect Savannah single-handedly! Smilin' Jack McShane runs headlong into a pack of meth cooking werewolves and the creature from the black lagoon! "Gripping. . . It'll leave you wanting more." 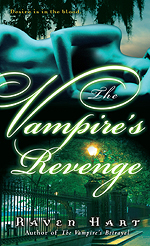 Mysterious vampires land in Savannah to rock William's world and threaten Jack's place in it. If that wasn't bad enough, a plague among blood drinkers threatens to make the merely undead really most sincerely dead. "Raven Hart drives a stake in this masterful tale." Southern aristocrat vampire William Cuyler Thorne and good-old-boy blood-drinker Jack McShane must protect Savannah's human residents from things that bite in the nightif they don't stake each other first. A ghost ship in Savannah harbor and a visit from William's evil sire Reedreck are harbingers of bad things to come. Site design © & maintenance by xuni.com. All content © 2007-2019, Raven Hart.